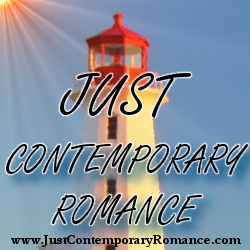 Just Contemporary Romance: What Kind of Shy? Congratulations to "Dee", the winner in Leslie's giveaway. Please contact JUST CONTEMPORARY ROMANCE to claim your prize. Back in my fabled childhood days, my parents ranked good manners the most essential skill imaginable. I didn’t mind; being polite seemed better than being confrontational, forward, or rude. Then my eight-year-old brother fell into a boat slip at Lake Altoona (in Georgia) and discovered he couldn’t really swim. I raced the short way to where my father and mother were entertaining friends and stopped short. Drinks in hand, sitting around the twenty-two-foot cabin cruiser, chatting in the bright sunlight…. You NEVER interrupt an adult. Never. Only spoiled brats do that. The adults took off, and saved my brother. Instead of being punished for being rude, I was punished for not interrupting sooner. Now and then, I retrieve that memory, dust it off, and wonder what, if any, part that episode played in the shyness that haunted me most of my life. Surprisingly, I could function when I had to. I answered questions in class, could give directions, competed and often won in 4-H events. But whenever I could, I’d be in a corner reading, or on a pony reading, or imagining myself far away in a relationship conjured up from a story I had read. Social? Not me. I had the skills my parents said were important to be successful in social settings, but no desire to interact. For a long time, I blamed the etiquette drills for my reluctance to shine in public venues. Notwithstanding, I became a teacher. For many years, I only spoke when spoken to among adults. Didn’t use my mentor’s first name for 15 years. Fortunately, I’ve always been able to relate to kids, and was passionate about education. Any shyness aside, I like to believe I excelled. Now that I’m no longer teaching, it’s harder than it was to go to the grocery store or on any public excursion. In the solitude of the house, I still find myself apologizing to the dogs if I offend them, or saying “please work” to gadgets that malfunction—using all the outdated courtesies I was told would make me accepted anywhere in life. Sometimes I blame my robotic politeness as the real reason I was never comfortable around others. Realistically, I know that isn’t true. Being polite is fine. What I still can’t figure out is—how real is introversion, and how do extroverts actually enjoy all that attention? So what kind of shy are you? Cyberspace is an introvert’s greatest friend—I’d love to hear about you. Introvert or extrovert? How do you deal with extremes in either case? Please comment. You know, if you want to. Introverted and insecure, Jody Colton would rather not deal with the world, or the betrayals that come with caring too much. 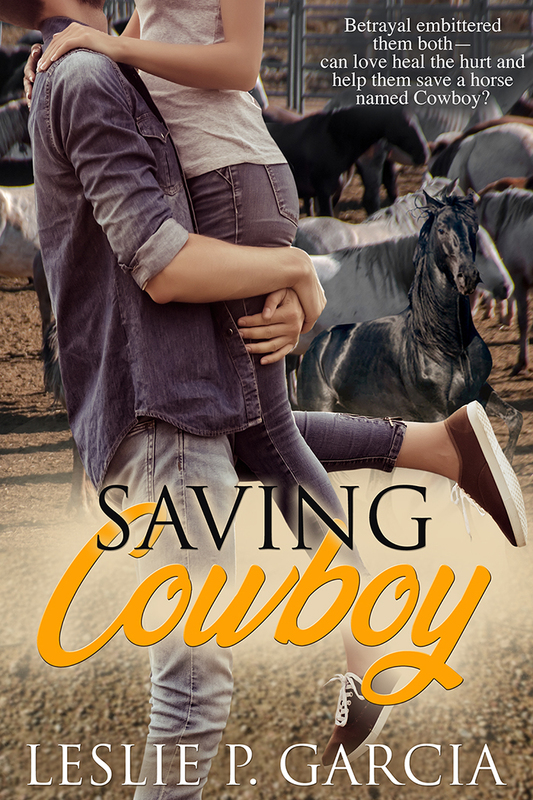 But when she sees Cowboy, the horse stolen from her, in a slaughter pen, she’ll stop at nothing to save him. Joe Roberts was on top of the rodeo world until a bronc named Cowboy ended his career. 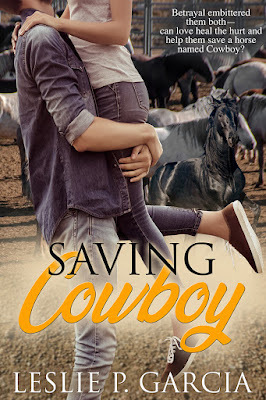 Appalled that the former Bucking Horse of the Year is in a kill pen, Joe plans to say goodbye to Cowboy and move on—until Jody ropes him into a wild plan to save Cowboy. Neither Jody nor Joe want commitment. They just want to save Cowboy. But when attraction and desperation morph into stronger feelings, can they risk the one thing they both blame for destroying them—can they risk love? Giveaway ends 11:59pm EST Dec. 9th. Due to GDPR regulations you no longer need to submit your email address in the comments. If you have been selected as a winner your name will be posted at the top of the post. You may then contact maureen@JustContemporaryRomance.com to claim your prize. Your email address will be shared with the author/publicist providing the giveaway. Congrats on the book release, Leslie. And thank you for sharing your experience! That must’ve left really an impression. I’m not exactly shy myself but I’m quite a hermit, even on cyberspace I mostly lurk - heh, that sounds creepy, doesn’t it - but I rarely engage even in cyber-convo. I’m quiet that way. Quiet is good, Dee. Thanks for coming by and talking to us! Good luck in the drawing. Our parents do drill a lot of who we are into us but I also believe our inner person will eventually shine through. I was an introvert when I was younger -- still like to be occasionally but as I grew up, I learned how to be an extrovert, especially at work and I kinda like it. I have my moments where the spotlight isn't for me but I get to pick and choose how I'll react instead of automatically becoming my old introverted self. Interesting, Ada. I agree that life either forces your hand or encourages you to adjust sometimes. I used to remind a daughter who gave up an Honors scholarship because she hated socializing so much that there are very few jobs with 0 interaction. Thanks for sharing==and good luck! I love your post. In person, I'm, an introvert. I prefer to be in a corner, people watching. However, if you offend me, then the claws come out. On the computer, I'm totally an extrovert. I'm talkative. At times, I can even be funny. I'm delighted you enjoyed the post, Kim. We might be separated-at-birth twins. When I'm offended or outraged, I can take on the world. And FB (still my usual cyber haunt) lets me be more open than I ever am personally. Good luck in the drawing, and thanks for coming by. Im a huge introvert now. My first job I worked as a cashier at a grocery store, then my next job of 7 years, I worked in a facility where my department only consisted of 5-6 people in which there wasnt a revolving of customers around me like my cashier job. So I believe that made me even more introvert, and I also blame social media lol. But I will say if you are a person who talks alot then I tend to open up quickly. Hmmm---so are introverts born or made. I have worked as a cashier in a hardware store, and often wanted to hide somewhere. (Maybe because I have no business in a hardware store!) But I agree that an outgoing person can help introverts==at some point, we just might as well talk back, right? Thank you for commenting, Carissa! Sorry--I forgot to wish you good luck! Hi, bn100. Thank you for commenting again. Good luck! Several have mentioned becoming more introverted over time, which I find interesting. Maybe we have to force ourselves to be more actively involved in work and social activities before certain ages? I feel that I'm sliding back into being a recluse myself. Thank you for commenting, and good luck! I'm an introvert - crowds aren't a lot fun unless you have to be out and about. I'm with you, Anita. Crowds are hard to deal with! Thanks for dropping by, and good luck in the giveaway. Unique and heartwarming. Not sure if I'm an introvert, but my dream is to live in the desert...alone. Alone in the desert has a certain charm, Anonymous! Thanks for the kind words and for dropping by. I missed this one earlier, but wish you luck when the winner is announced. Introvert throughout my nerdy childhood. Really didn't become an extrovert until I'd had kids and gained self-confidence. This year I wrote a poem as a eulogy to my mother-in-law, and I stood up in front of everyone to read it. Easy peasy when I didn't have to sing, LOL. Oh, Laney4! I chuckled and got chills when I read your reply. I so relate to being unexpectedly brave==I was required to speak for a college class, and was asked to do so at a well-known public meeting. I aced the morning and was so proud--and boy did I need the prize money--in the afternoon when it counted, I bombed. But doing it in the morning was such a sweet victory. And badminton! That's an unusual place for a song, it seems, but congratulations! Good luck in the drawing! Emma! Thanks for coming by. Yes, I knew you were not a shrinking violet. You have the courage of your convictions and the courage to be truthful. I love that you're teaching your beautiful grand and great-grand children lessons that served you so well. You were the field marshal and that honest mirror from the fairytales when I worked with you, and boy did we need you! Good luck in the drawing. I love to blog here on JCR, and hope you'll come back again. Your job sounds interesting. I like how you distinguish between shyness that must be overcome and the basic desire to be introverted. Thank you so much for visiting JCR and commenting! Thanks, Susanne! I'm glad you could drop by! Thanks to everyone who dropped by. I loved having the chance to hear from you through the safe distance of cyber space! lol CONGRATULATIONS to Dee, and Maureen, thanks for hosting me. Have a wonderful holiday season, and a sensational 2019!